Description: The contributions assembled in this book come from the 65th annual congress of the Catholic Bible Association of Canada (CBAC), entirely devoted to writings �outside the canon�. This volume offers two short overviews of what Jean-Claude Picard called the �apocryphal continent� and seven excursions into certain of its regions. It examines the rapports between the apocryphal and canonical writings, the different ways one can select and group these writings, historiographic Apocrypha, sibylline oracles, apocryphal gospels, the Gospel According to St. Thomas, the Syriac Apocalypse of Daniel, the Gospel of Judas and the Book of Enoch. By virtue of its varying angles of approach, this book provides a sample of the questions that remain to be asked about these writings �outside the canon�. Citation: Boris Paschke, review of Andr� Gagn� and Jean-Fran�ois Racine, eds., En marge du canon: �tudes sur les �crits apocryphes juifs et chr�tiens, Review of Biblical Literature [http://www.bookreviews.org] (2014). 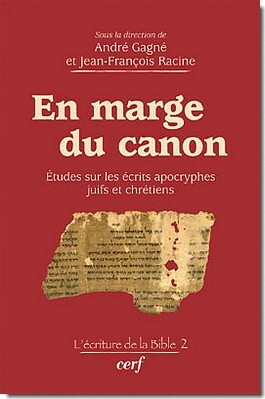 Citation: Edmon L. Gallagher, review of Andr� Gagn� and Jean-Fran�ois Racine, eds., En marge du canon: �tudes sur les �crits apocryphes juifs et chr�tiens, Review of Biblical Literature [http://www.bookreviews.org] (2015).